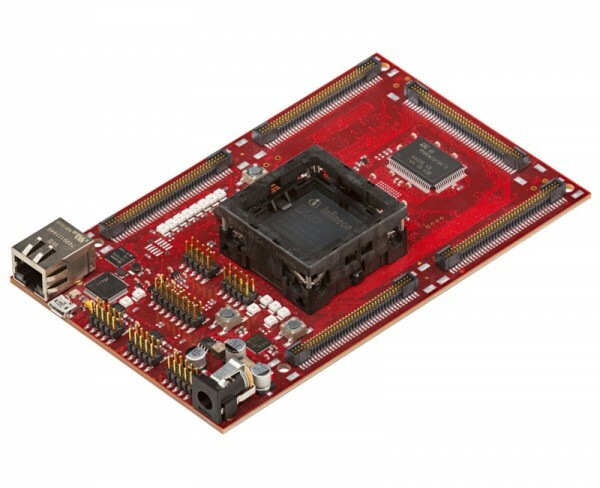 With this general purpose AURIX™ TC389XE evaluation board, customers can quickly start to develop, evaluate and test their software. The TC389XE is an Emulation Device capable of non-destructive tracing on dedicated 4MB SRAM. This SRAM can be configured to be used by a standard application. The board features various communication interfaces such as CAN FD, Gigabit Ethernet, SPI, FlexRay as well as to external memories. It also gives access to all the digital and analog IOs available from the LFGBA516 package of microcontroller. A downloadable User Manual helps with the installation, use and configuration of the board and includes the schematics and the layout. The schematics can serve a solid reference design for hardware engineers. With our software toolchain, this TriBoard offers a quick hands on and evaluation of Aurix™ 2G.